The Standard Button Hole might have been the first button hole you learned. It’s pretty easy and rather obvious. You bind off a few stitches in one row and you cast them back on in the next row. Easy, but not the best method ever. The button hole it makes is big and gaping. 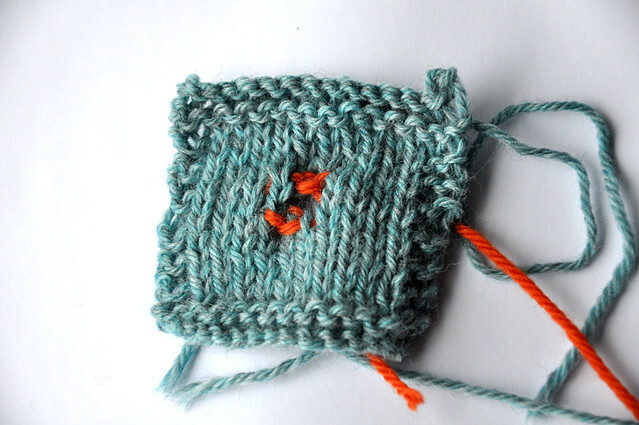 I find that even if I only bind off one or two stitches, the button hole ends up too large for standard button sizes when working with worsted weight or heavier yarn. It might not be a horrible choice for finer yarn, but the hole stretches easily and is pretty weak if you don’t take the extra steps to reinforce it. It also can be pretty lopsided looking depending on the BO and CO methods you use. I’m not a fan at all. Nice and quick review of a standard buttonhole option. I agree. I used this on my Favorite Cardigan, and the buttonhole band is very saggy. I’ve been long debating adding a piece of ribbon to the backside for reinforcement, but have yet to actually do anything about it.